Welcome back to our serial diatribe about ineffectual graphs! In this episode, we are going to have a quick rant about superfluous graphs. The best way to present and discuss your data is a matter that ought to be given careful thought. Today’s computing hardware and infrastructure have made graphic representations inexpensive and simple to create. There is also a generalization that “people” are inherently visual in nature, which has led to a proliferation of said graphic content. But I can assure you that not every human is visually oriented, nor is this always the best way to present ideas and concepts. If that were the case, we might as well leave off at the picture book stage of childhood and join Alice in Wonderland. Let me clarify that we are not discussing the creation of graphs for research and discovery. This is the proper time for experimentation. These following are considerations for after your data analysis is complete and when you are preparing to communicate your findings or ideas. You may have created numerous graphs along the way during your analysis and we tend to want to walk a reader sequentially through the story of our research, tossing in these graphs as waypoints. But that may be unnecessary. The goal of your final report is usually to succinctly present your ideas and conclusion accompanied by only the data necessary to support it. Work backwards from your understanding to decide what is needed. Now, let’s consider a little more carefully the question of what sort of data doesn’t belong in a graph at all. In general, simple and/or non-comparative data sets (i.e. a list of labels/categories with values for a single variable) typically belong in tables. Key entries, such as those discussed in the text, can be emphasized in the table with bold or other font effects. In this case, what you are providing is a lookup table for the data and the quantitative information is what is important. Values can be difficult to read off a graph. A graph is presented to show a coherent trend (typically one that can be described with an equation), such as linear, exponential, parabolic, etc. If a trend is non-steady or discontinuous and/or the main point is simply that the values are larger or smaller, a graph offers no additive benefit. And if there aren’t enough points to discern a trend, graphs start to look silly. Let’s poke a bit of fun and look at a few examples. This first graph must represent some sort of mathematical limit of a waste of space. Only one data point is represented (50.3%), even though another number is mentioned in the caption (15%). There’s no head-to-head quantitative comparison, which is always a good indicator that you don’t need a graph. Finally, does anyone really need help visualizing 50%? Ultimately, this graph looks more like an insignia than data. If you want to draw attention to the number, you could do so through the caption itself or place the caption in a call-out box. Tip: pie charts are particular offenders here. A related issue can arise from overly enthusiastic employment of bar graphs, particularly for data that are again inherently one-dimensional in nature, with no functional interrelationships. The example below is meant to show yes/no responses to a survey- the question as to whether sales are expected to outweigh expenses asked of different types of investors. The end result is difficult to interpret owing to the inappropriate usage of charts. 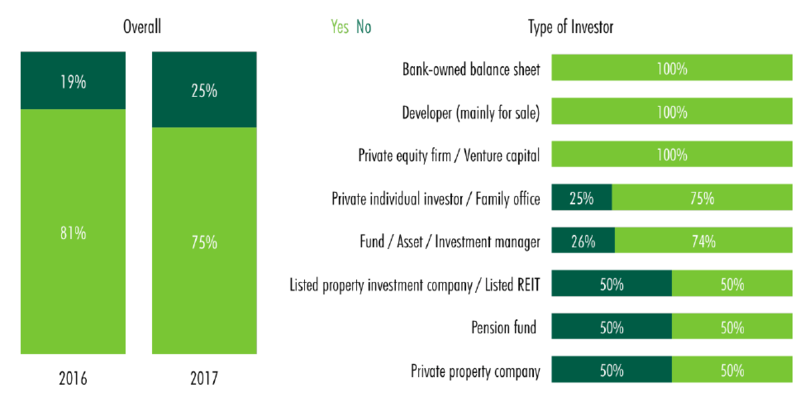 The Yes/No color key is far too small and the dark green appears a slightly different shade when used as a text color versus the bar chart fill. It is not clear which year the data on the right is from and the whole lot could be much more simply described with a couple of sentences and the use of terms such as “all,” “half” and ¾. The final example of the day is actually a clever graphic that has unfortunately been used to illustrate the wrong point . 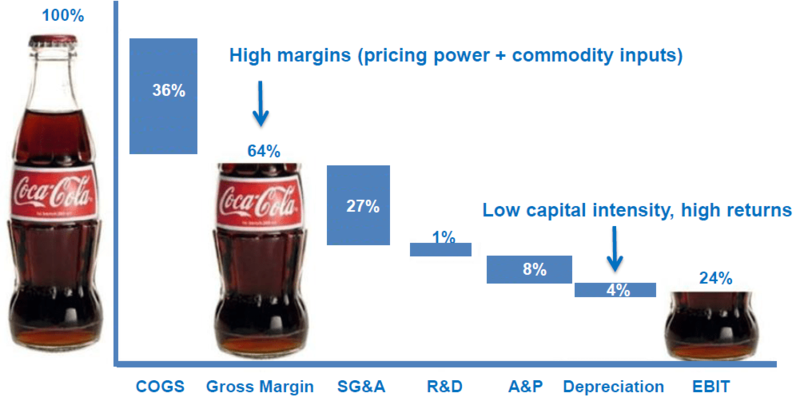 It is a waterfall chart showing how components of a Coke franchise sales translate into EBIT. The concept is great for showing the relative impacts of these metrics the bottom line. But the surrounding paragraph text (not included for anonymity) is all about how the author is of the opinion that Coke measures superior to other companies by these metrics. The comparison is implied by the usage of the adjectives “high” and “low” in the graph labels. But neither the text of the report nor the graph contain any such data from competitor companies, which begs the question, “High or low relative to what or whom?” The reader is asked to simply take the author’s word that these values are superlative. The purpose of the graph ought to be to actually demonstrate these relationships with comparators, not display points in a vacuum. If your intent is to invite data comparison, make sure your selected graphic is designed to do so. These examples will hopefully prompt some thought around the question “Do I really need a graph?” In our next post, we will assume the answer is “yes” and start to consider the details of design.